If you are staying in Reykjavik and long for nature and some trail running you do not have to go very far to fulfill your desire. We have put together a list of 5 great trail running options close to Reykjavik – not more than 20km away from the city center. These trails are best enjoyed from spring to autumn as harsh winter conditions make some of these trails inaccessible. In Mosfellsbær there is a 300 meter high fell called Úlfarsfell. Many people come here after work or on weekends for a refreshing hike. The hike to the top takes 30-60 minutes and there are a many paths to choose from leading up to the top. You can start your hike from one of the car parks by the fell or run 1-2km from the swimming pool Lagafellslaug to the foot of the mountain foot. The reward at the top is an extensive view over Reykjavik and it’s neighboring towns, Mt Esja, the Blue Mountains, Hengill geothermal area and the Reykjanes peninsula. Lake Vífilsstaðir (Vífilsstaðavatn) is a hidden gem in Garðabær, far from the hustle and bustle of the city. The lake has a well kept 2.5 km gravel path around it. The environment is very peaceful with birds the most prominent feature, just a few walkers or runners passing by and the occasional fisherman standing in the lake. After a circle or two it is customary to take a hike up to Gunnhildur, a small hilltop by the lake. The path is clearly visible and starts near the parking lot on the south end of the lake. There is also a path leading from the same place to Vífilsstaðahlíð (hill) which has soft trails that go between lava and green bushes. Heiðmörk is one of the largest outdoor areas next to Reykjavik. It is located southeast of lake Elliðavatn. There are beautiful trails in Heiðmörk which is an area with bushy vegetation and lava formation. Heiðmörk was proclaimed a municipal conservation area of Reykjavík in 1950. The area is very popular with outdoor enthusiasts. You can see people hiking, running, biking and even cross country skiing in winter time. 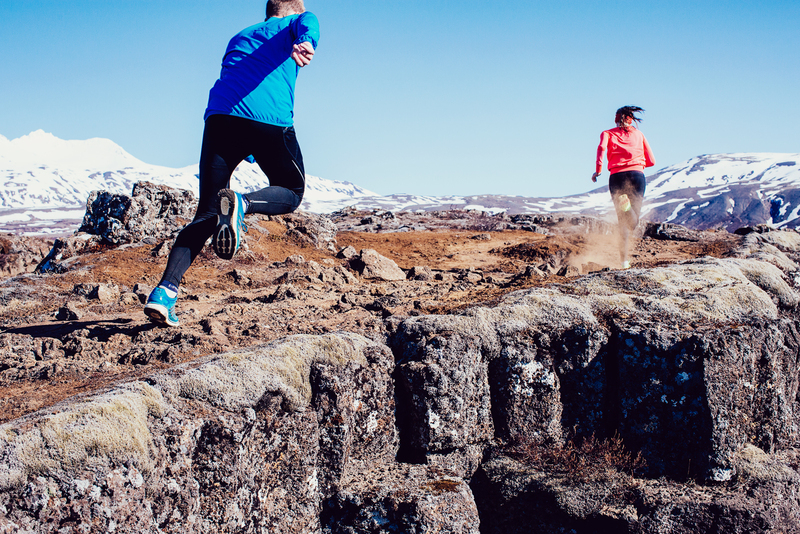 The gravel tracks in and around the Heiðmörk area cover over 40 km, making it the perfect place for trail running. Mt. Esja dominates the skyline to the north of Reykjavik and is one of Iceland‘s favorite hiking spots. People of all ages and abilities enjoying the nature on Reykjavik’s doorsteps, and runners use it a lot for training. The trails are clear and easy to follow. Esja is just over 900m high and has several walking trails to the top. The path to Þverfellshorn is the main walking trail to the top and perhaps one of the most crowded trail in Iceland. The hike to “Steinn” and back is just over 6km. Many people turn around at Steinn, especially those who see this as a training session, as the rest of the route to Þverfellshorn is more of a scramble than the hike up to this point. Helgafell or “Holy Mountain” is one of the most accessible and popular short hikes from the city. It lies in the land of neighbouring Hafnarfjordur, only a 20 minute drive from the center of Reykjavik. The distance from the parking lot in Kaldársel to Helgafell to the top of the mountain and back is around 6 km. There is more than one way to get to the top but the most common route starts from the north-eastern side of the mountain. The view from the top is spectacular over the urban areas of greater Reykjavik and also of volcanic formations, some of whom are easily accessible from Kaldarsel as well. Búrfellsgjá for example is one of the most spectacular places near Reykjavik.